Craig Shoemaker is a modern day Renaissance man. 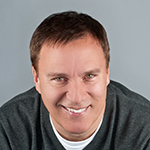 Best known for his engaging, relatable standup and iconic baritone-voiced character, The Lovemaster, Craig is far more than the jokes he tells on stage. He has shot multiple stand-up specials for TV, starred in numerous films, written two children's books, performed for four U.S. Presidents, has a doctorate degree and is even an ordained minister. His comedy stylings have earned him numerous awards throughout his extensive career, including Comedian of the Year at ABC's American Comedy Awards. While matriculating at Temple University, his work as a writer and actor earned Shoemaker two Emmy Awards. He wrote, produced and starred in the cult hit Totally Baked (Universal) nominated for a Stony Award . Another film he wrote and starred in, The Lovemaster (with Farrah Fawcett and Courtney Thorne-Smith) was voted the number one film at the Los Angeles Independent Film Festival. Craig's one-hour special, Unzipped, aired on Comedy Central, and the CD was on the Billboard Top 20 for six straight weeks. His half-hour Comedy Central special was voted by viewers as one of the "Top 20" stand-up specials of all time.. In May 2010, Craig received a doctorate in Humanities from California University of P.A. Dr. Shoemaker is passionate about using his celebrity to help those in need. In 2003, he founded the Laughter Heals Foundation, a nonprofit group dedicated to raising awareness of the healing powers of laughter. The Foundation conducts programs in after-care facilities that initiate healing through laughter. As founder and CEO of TheLaughterStore.com, Shoemaker is dedicated to making you laugh - any time and for any reason. Whether on stage, screen, or bookshelf, "The Lovemaster" is bringing laughter, healing, and unconventional fun to America today.